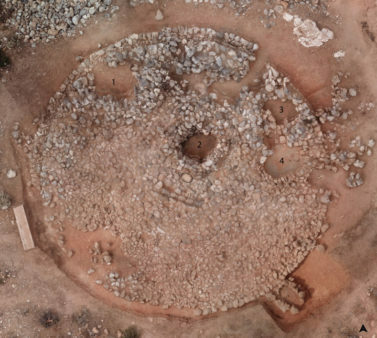 As part of a 5-year (2017-2021) programme of systematic excavations on Anavlochos, Crete, an Early Iron Age tumulus was discovered in August 2018 by a team from the French School at Athens, under the direction of Florence Gaignerot-Driessen. 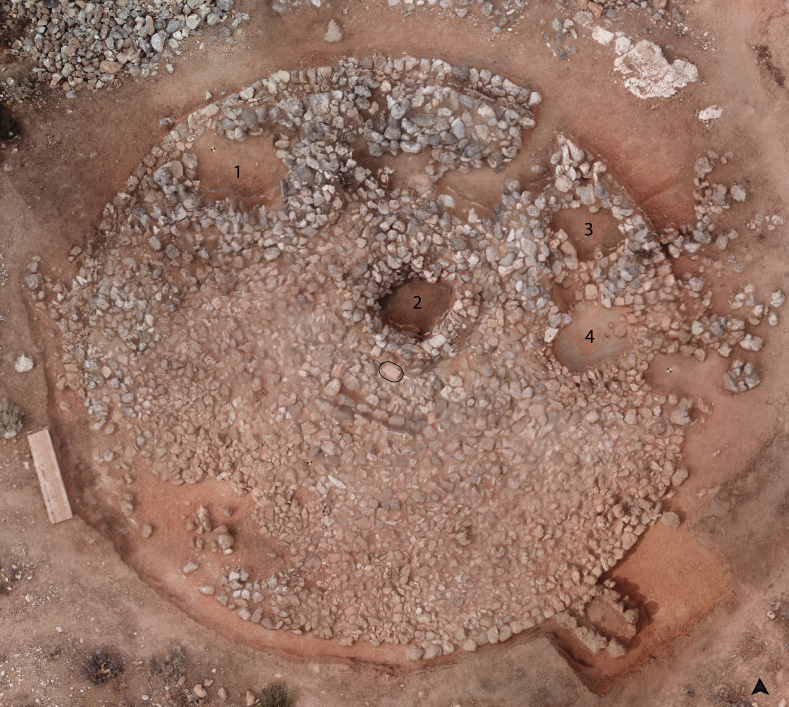 Inside a circle of limestone rubble, 15 m in diameter, three circular pits contained the remains of burials and cremation pyres. In the eastern part of the circle, a fourth pit, from which no human remains were recovered, yielded an assemblage of 15 vessels and five spearheads in a very good state of preservation. Under a sandstone block that marked the centre of the circular tumulus on the stone surface, was a rectangular pit, half built, half cut in the bedrock. 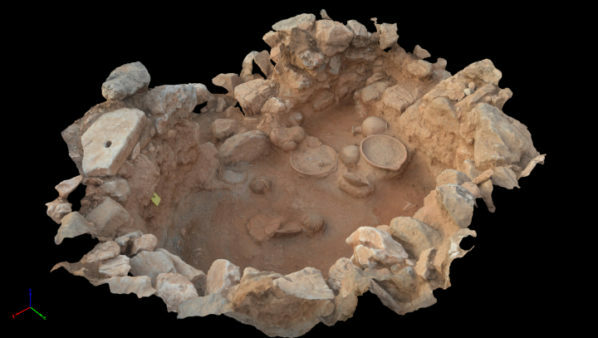 The location of this pit, the thick layer of charcoal in it, as well as the calcined side walls, human remains and artifacts recovered from it, all indicate that it is the location of the primary cremation of the first burial associated with the tumulus. A small cist grave has also been excavated on the south-east edge of the circular tumulus containing the pit graves, adjoining its enclosure wall. A preliminary study of the pottery recovered shows that this imposing funerary monument was in use during the 8th and the 7th c. BCE. This tumulus is situated in the lower part of a slope where three other tumuli, unfortunately very ruined by erosion and repeated looting in the past, have also been located. 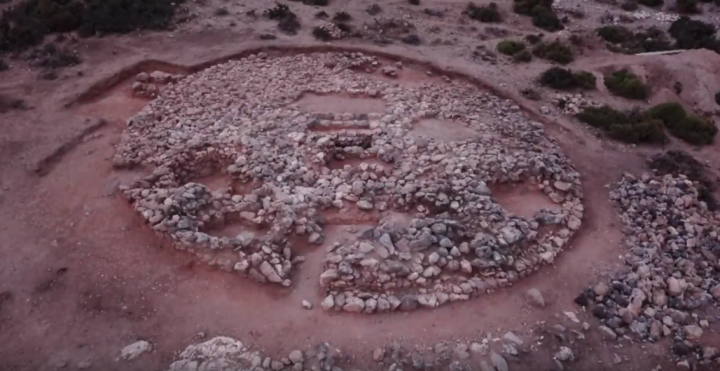 The excavation of the tumulus and the archaeological survey of this area have been completed. The 2018 excavations benefited from the support of the EFA, INSTAP, ARC programme Crisis (UCLouvain), ARPAMED, FNRS, Cyprus Institute and the universities of Lorraine, Stanford, North Carolina, Cardiff and Heidelberg.